The lamb we raise on the pastures here at Spy Dog Farm is so flavorful I actually look forward to the packages of “stew meat” that come back from the butcher’s. 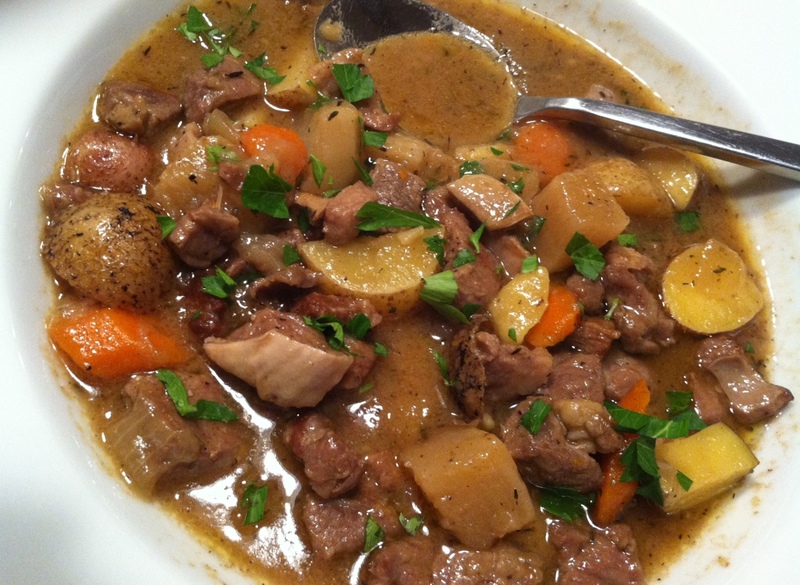 Among the meals we make from these scraps is a hearty Irish stew I continue to perfect. There’s nothing particularly complicated about this classic stew. Brown the meat, seasoned aggressively with salt and pepper, in batches at the bottom of a heavy pot. The secret ingredient is schmaltz, or the rendered chicken fat we collect while processing our Freedom Ranger chickens. Remove the meat and sweat plenty of onion, carrots and turnip until the onion has softened. Now return the meat back to the pot along with 2 or 3 cups of stock made from Freedom Ranger carcasses–or better yet, from the feet, as described in yesterday’s post. Add a couple of bay leaves and a generous teaspoon of dried thyme (a fistful of fresh thyme if you have it.) Bring the pot to a boil, then place in a 225-degree Fahrenheit oven for 45 minutes. The carrots should be softening. At this point, add pieces of potato you’ve raised in your own garden. Since the potatoes cook the quickest, you want to add them last so they don’t fall apart. Return pot to the oven and continue cooking another 45 minutes, or until the potatoes are cooked through. Here’s the final secret to this fabulous stew. To thicken the cooking liquid, I make a roux with 2 more tablespoons of schmaltz and 2 tablespoons flour. When the roux has bubbled for a couple of minutes, ladle those juices into the roux, whisking briskly, then pour it back into the stew and give a good stir to fully incorporate. Serve your stew in large bowls, garnished with freshly chopped parsley. Some Irish soda bread on the side with lots of butter from your own Jersey cow wouldn’t be a bad thing at all.